Having cancelled two of its scheduled events in a span of several weeks, Strikeforce has reportedly elected to let rising welterweight Jordan Mein fight UFC veteran Forrest Petz at a November 23rd Score Fighting Series event. According to a press release from the SFS promotion, which is the property of The Score television network in Canada, Mein “is on loan” from Strikeforce for the upcoming card. The bout will headline the November 23rd event which will be hosted by Hamilton, Ontario. The card will be broadcast live on The Score as well as AXS TV. 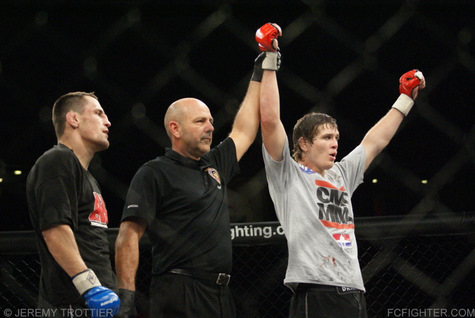 The 23 year-old Mein is coming off a unanimous decision win over Tyler Stinson at a Strikeforce event in July, to rebound from the split decision loss he suffered against Tyron Woodley in January. In his Strikeforce debut last September, the Lethbridge fighter stopped veteran Evanglista “Cyborg” Santos in the third round. Petz will head into the event having won four straight fights. Most recently the 37 year-old fighter scored a memorable, second round, stoppage win over Sergej Juskevic at a SFS card in March. The last man to defeat the Ohio welterweight was Brian Foster, who stopped Petz in the first round at a UFC Fight Night card in September, 2010.